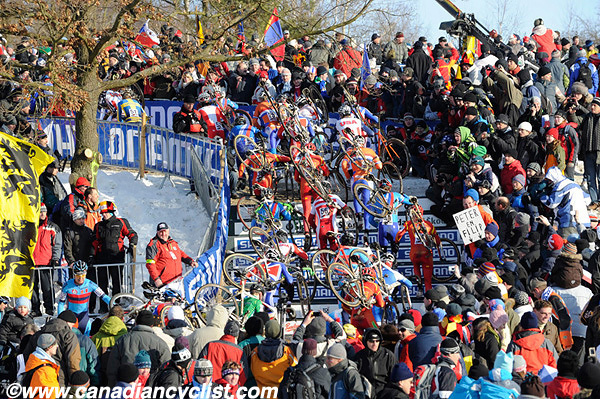 Earlier this afternoon, the UCI Management Committee announced that, for the first time, the Cyclo-cross World Cup would be coming to North America for the 2015-16 season. The World Cup season will open in Las Vegas on Wednesday, September 16th, at the well-known CrossVegas event during the Interbike trade show, and then head to Montreal for Round Two on Saturday, September 19th. The organizers of the Montreal event will be Gestev, the highly respected, Quebec-based organizers of many Mountain Bike World Cups and World Championships. We spoke with Patrice Drouin, one of the founders of Gestev, about this exciting new venture. Canadian Cyclist: This was a sudden announcement. How long have you been working on getting a Cyclo-cross World Cup? Patrice Drouin: For a couple of years we have been working on it with the UCI and Brook Watts, the promoter of CrossVegas. One of the key elements was to have two World Cups back-to-back, so athletes and teams could have two races at the same time in North America. CC: So the first one is CrossVegas on the 16th, and how about yours? PD: Yes, CrossVegas on the 16th of September and then we will be on the 19th. CC: And whereabouts in Montreal? PD: The location will be announced a little bit later, because we have a few options, and some things need to be confirmed. But it will be announced in a few weeks, in February. The City is really happy to have this going, as well. PD: Yes, it is new, but not far from what we have been doing for years. We've been studying it quite a bit. I've attended a few world championships, I've been to CrossVegas and, for us, it's not that complicated to put on such an event. We will also have the support of the UCI technical delegates and staff to guide us to do the best event possible on the sport side. On the event side, everything around [the races] will be well taken care of, as we do for many sports. CC: The World Cup is about the elite riders; will you have any other events for the domestic racers? PD: The actual plan, if everything works well with the site we have identified, is to do the elite race on the 19th, Saturday, and an open race on Sunday. It would be open to other classes, the main classes. We will be defining those classes with the FQSC and CCA down the road. So, yes, the elite on Saturday and a participation race on Sunday. This is for the promotion of the sport, because it is very much a growing sport in North America, and especially the Northeast coast. So we definitely want to support it by doing this kind of race on Sunday. We are sure it will be well attended. There is a huge fan base in the Northeast of Canada and the United States. So we will be doing this event on Sunday for everyone. What form it will take in the future, I don't know yet. We need to see the results and the turnout from the first round, and receive information from the various sources [UCI, teams, riders, media], what they want, what they need, what they like, so we can make the next edition better. CC: So how many years do you have an agreement for? PD: The first contract is for two years. I know the UCI is very happy, and one of the big announcements of the Management meeting was the expansion of cyclo-cross. Cyclo-cross will be a true world sport. It's not just European anymore, it's going across the Atlantic, it's a big step for the sport. It reminds me of when we created mountain biking in 1989 [for the 1990 season], with the first world championships in Durango, then Europe and then Bromont ... it is a reminder of how when mountain bike did its first world championships, how important it was for the UCI that, in order to make the Olympics in 1996, it was international. I think it is part of the goal that, to make cyclo-cross part of the Olympics, that they have to make the sport much more international. So I think we are a first step towards that direction. I'm pretty sure we will see some countries coming to our event that do not go to the World Cup in Europe, such as the Central and South American countries. It happened with mountain bike world championships that we saw countries that do not go to Europe, the federations were sending their athletes here because it is closer to them. I think it will generate quite a bit of attention in these countries.